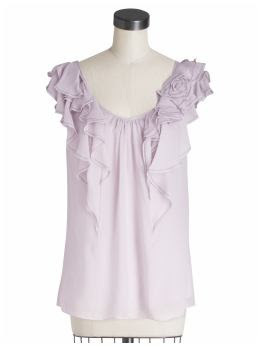 Rebecca Taylor's chiffon and silk Date Me Top retailed for $260 at Piperlime but is no longer available. If you've been searching for a similar top for less, search no more! I spotted this great alternative from Blue Tassel (also at Piperlime) which is on sale for a very reasonable $38.97. Click on the photo below if you're interested in purchasing. Cute! I'm not a post plugger, but I thought of you when I posted about how similar the Lanvin and Gap patent leather ballet flats are!